Things have been a little quiet here of late again... haven't they? I've been quite busy over the last few weekends and have caught Doctor Who at very strange times. With the heat and various projects on the go, I've also struggled to find motivation. The important thing to remember about tonight's episode was that it was character driven and not monster driven. There was nothing particularly amazing about the Krayafis (space cockerel), it's presence on Earth served primarily as a menace to the already tortured mind of Vincent, and a plot device to bring the worlds of van Gogh and The Doctor crashing together. Having said that, I do wonder about the space poultry... there is some ancient Alcester folklore concerning such a creature that is said to prowl a wooded hill near where I live... protecting the ill-gotten gains of a robber. I think there were a couple of visual references to Clash of the Titans in the episode - The Doctor using a mirrored device to observe the monster (plus a nice touch with the visual nods to Hartnell and Troughton as well), and with the statue of Perseus and Medusa in the gallery. I also wondered if the shot of George and the Dragon on the church entrance was a reference to the Primeval episode that featured Tony Curran (the actor playing van Gogh); the episode in question concerned a medieval knight stranded in the modern world, pursuing a prehistoric beast. While Curran's accent as the painter was questionable (blatantly slipping into his native Scottish twang), this I can easily forgive as his portrayal of the character was immensely sympathetic and emotional. Production-wise, Dutch accents can be hard to take seriously if not portrayed well by a non-Dutch actor, so he may have just decided to leave well enough alone. In universe you could easily attribute this to Amy understanding him with a Scottish accent through the TARDIS translation abilities. There were some nice touches in the character interaction. 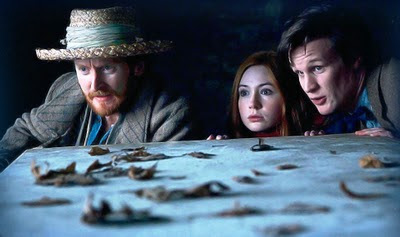 Vincent perceiving that Amy was still grieving for Rory even though she could not even remember even him consciously herself; Vincent visibly struggling with his personal demons - constantly facing the rejection and lack of understanding dealt to him by his peers, and writhing with deep depression and anxiety during the night the Doctor and Amy needed him (reasserting himself by morning in bipolar fashion). "To me, van Gogh is the finest painter of them all. Certainly the most popular, great painter of all time. The most beloved. His command of colour, the most magnificent. He transformed the pain of his tormented life into ecstatic beauty. Pain is easy to portray but to use your passion and pain to portray the ecstasy and joy and magnificence of our world... no-one had ever done it before. Perhaps no-one ever will again! To my mind, that strange wild man who roamed the fields of Provence was not only the world's greatest artist, but also one of the greatest men who ever lived." Van Gogh died with little in the way of either wealth or critical recognition. I think as human beings we all have a need for acceptance and recognition on some level. It doesn't have to be artistic recognition... but we all need to feel that our time on Earth is of some worth to the people around us. 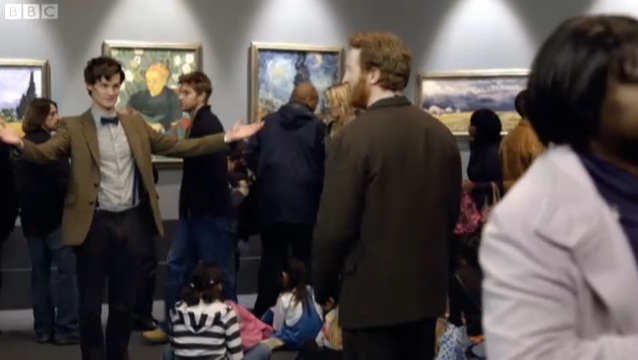 So in this respect, I think van Gogh's story and this episode of Doctor Who can resonate with us on an extremely deep level. On the evening of broadcast, the BBC issued a post transmission statement saying that anyone affected by issues raised by the episode should contact a provided helpline. It was fairly obvious to me that this was referencing the mental health issues and not the fantasy elements. I cannot say how appalled I am at the cynical and mocking response from some quarters, towards a genuine attempt at the BBC to do some good. "The way I see it, every life is a pile of good things and bad things. The good things don't always soften the bad things but vice versa the bad things don't necessarily spoil the good things or make them unimportant... and we definitely added to his pile of good things... and if you look carefully maybe we did make a couple of little changes..."
We can never fully know what effect our actions will have on the lives of others... but I truly believe that we need to strive to add to other people's "pile of good things" if we want to better their lives and our own. It is an attitude that I believe is fundamentally at the heart of Christ's command to love our neighbour as ourselves... and his appeal to us that the circle of who our neighbours are... is actually a lot wider than the people we take mutual comfort in. People have free will and sometimes we can't pull them back from the precipice. Mental illness is actually a pretty good example of this. One of the reasons there has been a stigma attached to it for so long, is that we fail to properly acknowledge irrational behaviour. We look at it from a perspective and we try to rationalise the actions of those who suffer... which isn't really helpful. In these cases, I believe we should do our best to try and bear with those who suffer instead of trying to explain away or callously dismiss what they are going through. Going back to my general thought... a perceived negative outcome isn't a reason for us not to do our best to save people. Every one of us, if we just took a little more time to add to other people's "good pile" instead of obsessing over our "bad pile", we might be surprised at what a difference all those small changes make to the big, big picture. I would like you to close your eyes and imagine that you are in walking through an art gallery. As you pass by the masterpieces and works of your favourite artists, you notice an alcove to the side. Entering the alcove you see that the artist exhibited within is actually... you. Take a good look at the paintings... maybe some of the scenes depicted are areas or times in your life that have been painful to you. Look closer though. I'd like you to imagine images of the people you care about, and who... even if you may struggle to accept it... care about you. "O LORD, you have searched me and you know me. You know when I sit and when I rise; you perceive my thoughts from afar. You discern my going out and my lying down; you are familiar with all my ways. Before a word is on my tongue you know it completely, O LORD. You hem me in—behind and before; you have laid your hand upon me. Such knowledge is too wonderful for me, too lofty for me to attain. Where can I go from your Spirit? Where can I flee from your presence? If I go up to the heavens, you are there; if I make my bed in the depths, you are there. If I rise on the wings of the dawn, if I settle on the far side of the sea, even there your hand will guide me, your right hand will hold me fast. If I say, "Surely the darkness will hide me and the light become night around me," even the darkness will not be dark to you; the night will shine like the day, for darkness is as light to you. For you created my inmost being; you knit me together in my mother's womb. I praise you because I am fearfully and wonderfully made; your works are wonderful, I know that full well. My frame was not hidden from you when I was made in the secret place. When I was woven together in the depths of the earth, your eyes saw my unformed body. All the days ordained for me were written in your book before one of them came to be. How precious to me are your thoughts, O God! How vast is the sum of them! Were I to count them, they would outnumber the grains of sand. When I awake, I am still with you." You may feel deeply alone, unloved and not very special. However, I assure you that is not the way God sees you. You are NOT alone and you ARE loved. Thank you for writing this. Seriously, thank you.